Surrounded by pale blue waters, the island province of Bali, Indonesia, offers the perfect balance of peaceful escape and non-stop action. Whether you want a lazy lagoon holiday or a surfer’s paradise, pack your best togs and sunnies and get yourself to Bali ASAP. 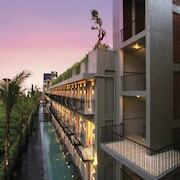 You don’t want to miss the next dazzling sunset over Seminyak and Legion. 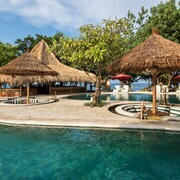 As a resort island, accommodation in Bali is plentiful, especially around the southern towns of North and South Kuta and along the northern coastline. At Wotif, we suggest a scientific way to select Bali hotels: Look at pretty beach photos, choose your favourite, and stay nearby. You’re welcome. 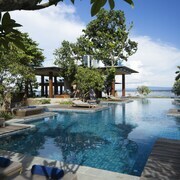 In Bali, travellers have the perfect opportunity to chill out—on the beach, by the pool at their Bali accommodation or surrounded by natural beauty at the Sekumpul Waterfalls in Singaraja. The trick is settling on the right beach—this is what we call an embarrassment of riches. You won’t forget the name of Padang Padang Beach, since you have to say it twice. Great for swimming and gorgeous views, Padang Padang was one of the filming locations for a Julia Roberts flick about food, personal reflection and affection—sorry, the actors won’t be there. 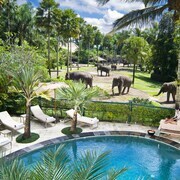 Meet other primates at the Sacred Monkey Sanctuary in Ubud, slightly inland from the southern coast. If you’d rather make finned friends, grab snorkelling gear and dive into the pristine waters at Crystal Bay. 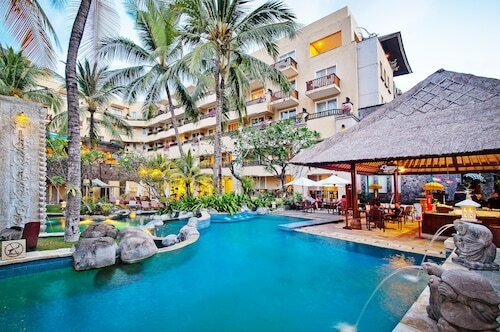 To participate in a cultural event and immerse yourself in the customs and cuisine of Indonesia, book accommodation near the Bali Convention Centre, where you can take in a traditional dance show, sample island eats and stay close to all the action in waterfront South Kuta. 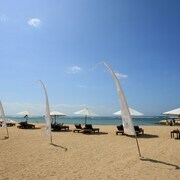 Select flights to Bali that touch down at Ngurah Rai International Airport (DPS) in Denpasar on Bali’s southern coast. 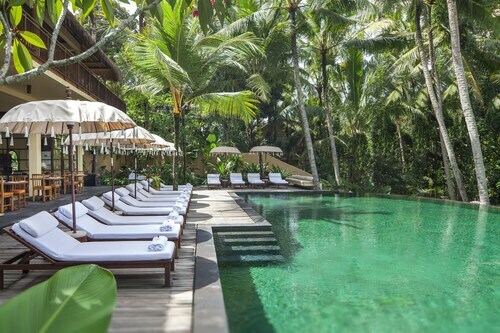 You won’t have to look far to stare into the depths of the Indian Ocean or to get to one of the smashing hotels in Bali for check-in. To get around the island, take advantage of public buses, which stop in the popular neighbourhoods. If you aren’t good at sharing, that’s OK—you’re on holiday! Taxis are abundant, so hail some metered wheels. Otherwise, book one of Wotif’s car hires to cruise Bali with the windows down, but remember that there will be traffic. The island’s rainy season covers October through March, but these intermittent warm showers won’t keep you indoors with hot tea. If you prefer total sunshine from dawn to dusk, consider visiting during the drier off-season between April and September. As you plan, keep colourful local festivals in mind, from the lunar New Year celebrations in March to the Bali Arts Festival in June, as well as several other opportunities to celebrate in Bali. Let’s be real, it’s always a good time to book a Bali holiday, especially with Wotif. Our travel sleuths have scouted out great deals on airfares and accommodation, so you can mix and match the getaway of your dreams. 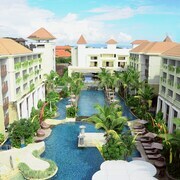 Hotels in Bali start at AU$21 per night. Prices and availability subject to change. Additional terms may apply.